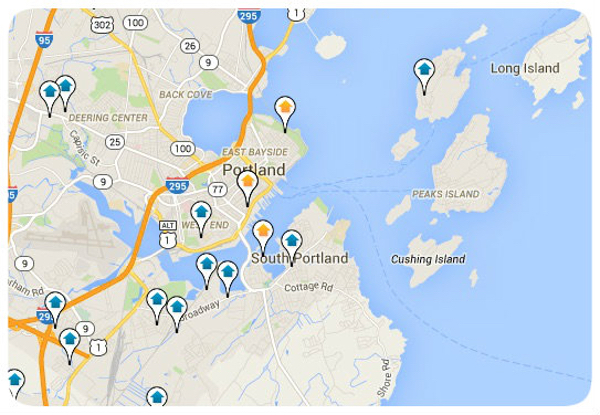 To many people, it is hard to disassociate Portland from the state of Maine. Portland is the largest city in Maine as well as the County seat of Cumberland County. Portland is also one of the fastest growing cities in the state with the current population within the city proper at 66,214. The urban area of Portland has a population of 203,914. The Greater Portland Community (about a half hour drive from downtown) has a population of approximately 500,000. The city itself as a total area of 69 square miles. 21 square miles of that area is composed of land while 48 square miles belong to the waterways in Casco Bay. In-town Portland is primarily made up of neighborhoods 'On the peninsula'. These neighborhoods include: Munjoy Hill/The East End, The West End, Bayside, Parkside and the Old Port. Off the peninsula, other neighborhoods include: Deering Center, North Deering, East Deering, Back Cove, Oakdale, and Riverton. Single-family homes are the most popular residential purchase (approximately 63 %) while condominiums represent 20 % of purchases and multi-family homes account for 17 %. The median size home in Portland is 1508 square feet. The average year of construction is 1939. Portland has some of the countries oldest housing as 24 % of the homes currently occupied in the city were built on or before 1900. Homes built between 1980 and 1999 represent 15 % of homes in the city and homes built between 1940 in 1959 also represent 15 %. Homeowners represent 42 % of residents while renters represent 57 %.